I’ve always believed that to be successful, you need to find a product that is nostalgia wrapped in excitement. That’s exactly what Coral Creek has done with the release of their new self-titled EP. They are a country band with a fascination for an entire world of music beyond those simple roots. With the recent additions of former Leftover Salmon member, Bill McKay, and Grammy Awarding winning fiddler, Luke Bella, Coral Creek is a band transformed. These two join forces with band leader and guitarist, Chris Thompson, and the lock tight rhythm section of Rob Garland on bass and Jack Watson on drums. This five piece convened in the studio with renowned musician and producer, Tim Carbone, to record what would become Coral Creek. Immediately with the opening track “Way Back” the listener is slapped in the face with that buttery nostalgia for home. All of these warm feels wrapped tightly in a rock beat with a New Orleans brass fill make for a great start to the album. “Mountain High” is all Colorado country reminiscent of a Summit County honkytonk bar on a Thursday. “Get Ready To Fly” features some soaring harmonization and powerful fiddle work for Mr. Bulla. Bill McKay gets his chance on the gritty blues song “Cryin Bout My Baby.” Thompson has truly assembled an all-star lineup with this version of Coral Creek. “Cage Without A Key” makes the most of the talent assembled with some amazing solos juxtaposed against the honest vocals of Thompson. We are again left thinking about home with the utterly evocative “Porch Light.” It’s easy to find yourself singing the lyrics to many of these tracks even listening to them for the first time. “Ballad of Catherine Lee” is a towering narrative tune and easily the climax of the record. The dark and brooding “Rooster & Dawg” contains some of the deepest and poignant lyrics in this offering. The playful slam-grass tune “God Is Pink” gives some pintsized perspective on the Holy Spirit. “Comes A Time” again hits all those feelings and memories that made us start going to see live music in the first place. Coral Creek is a solid effort from a band that seems to have finally found stable footing with this new and extremely experienced lineup. Chris Thompson has always been a competent bandleader, but in years past his sound has leaned more to country than bluegrass. 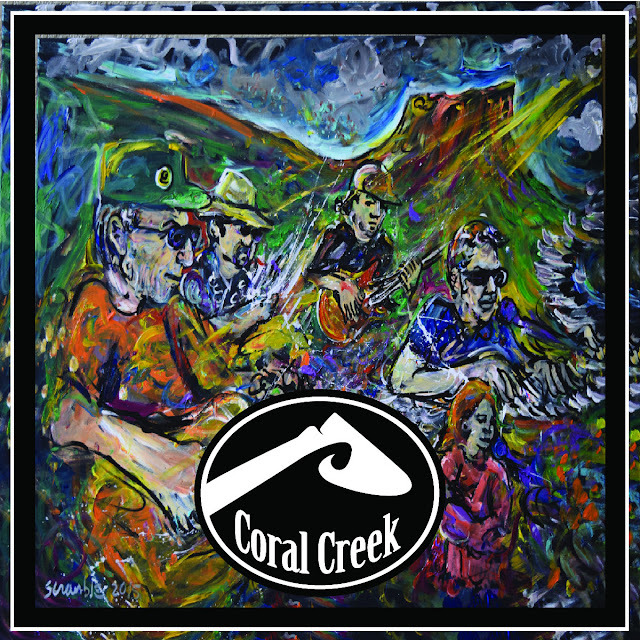 Now with an arsenal of talent, Coral Creek has expanded their sound to include a wide array to styles and tones that reach into jazz, rock, zydeco, and more. It would appear that with this release they are ushering a new era for the members of Coral Creek. Given these new developments and the fact that McKay is in the lineup, I’d say it’s time to check them out in a live setting.